Click on the bars below to all the subdivisions in Cherry Hills Village. You can also view the most popular searches such as ranch style homes, new construction, homes with a pool or houses with mountain views. Click to see Local Subdivision and Complex Maps. What is Your Cherry Hills Village Home Worth? Cherry Hills Village is the definition of luxury and is among the most sought-after property locations in the Denver metropolitan area. Sitting adjacent to the I-25 south of Denver proper, Cherry Hills Village is an unparalleled town for single-family home properties that exceed expectations. Opulence abounds in Cherry Hills Village, with luxurious homes that cater to all tastes. Thanks to its ideal location close to downtown Denver and within reach of the beautiful Rocky Mountains, Cherry Hills Village is an enviable treat in the heart of Colorado. Homes in the town are spacious, ranging from a third to three acres and most custom properties are at least 4,000 finished square feet and as much as 15,000 finished square feet. Such palatial homes are attractive to homeowners, which is why Cherry Hills Village CO has become a hugely popular location and is noted as Denver’s most upscale town. As mentioned, Cherry Hills Village has fantastic single-family homes for all needs, including Glenmoor, Cherry Hills Park, and Buell Mansion, a trio of gated subdivisions with 24/7 security, mountain views, and spacious plots. Buell Mansion is a stunning example of Colorado opulence, mixing beautiful homes with stunning scenery along the lakefront of Buell Lake. Glenmoor is also notable for being a world class golf community nestled on the Glenmoor Country Club golf course. For those who like to spend time with horses, Old Cherry Hills Village is a must-see location. This elegant subdivision has many properties with specific zoning for horses, while its mix of old and new custom estates is gorgeous. Homes in Old Cherry Hills Village are inspired by various architectural designs, from Tuscany mansions, Tudor houses, and fully modern ranches. As one of the most extravagant towns in Denver, Cherry Hills Village has been attracting homeowners for decades, allowing a vibrant community to develop. For those who like to wind down in leisure or enjoy a vigorous round of golf, the Glenmoor Country Club is a fantastic choice. However, Cherry Hills Village also hosts the Cherry Hills Country Club, which offers a luxurious experience whether on the golf course or in the spa. 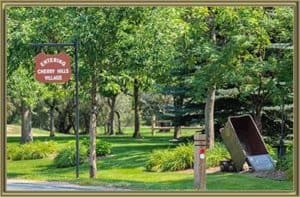 For the outdoors enthused, Cherry Hills Village CO has much to offer, including the wonderfully designed John Meade Park and Three Pond Park. Of course, the town is also on the doorstep of the Rocky Mountains where unlimited trails to suit all skills are available. As one of Denver’s leading upscale communities, Cherry Hills Village boasts an exuberant nightlife, whether you are looking for a quiet escape in a fine dining restaurant, or a fun evening mixing it with locals. Sitting close to Denver, Cherry Hills Village also has all the best aspects of a major city, including leading amenities, travel links, and access. See all the Things to do in Cherry Hills Village CO.
As well as being experts in home acquisition in Cherry Hills Village, the team at Gold Compass also has expertise in selling properties in the town. If you are selling an estate in Cherry Hills Village, our local agents can guide you through the process, providing you with knowledge and confidence. You can get a Cherry Hills Village Home Value Instantly Online. Our detailed approach to helping customers includes expert advice on pre-listings and valuations and information about market trends in the area. Our experts are available now to discuss home sales in Cherry Hills Village and can arrange a free staging consultation. Magnificent homes and grand locations are available throughout Cherry Hills Village, making it the go-to destination in Denver for high-end living. At Gold Compass Real Estate, we provide a Free Personalized Market Report to help prospective buyers understand the local market. Whether you are buying or selling a home in Cherry Hills Village, call us at 303-325-5690 to speak to one of our experienced real estate team members. Gold Compass is the best choice for luxury real estate across Colorado, including the West Metro, Foothills, and Denver areas.